Annapurna trekking in Nepal Himalayas. Annapurna trekking is located in an area of annapurna mountain in the western part of Nepal. 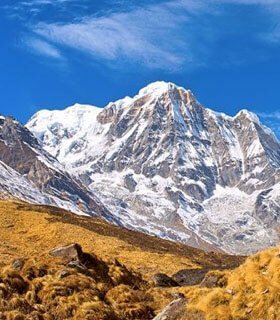 Trek in Annapurna region holds most of the very famous trekking routes of Nepal includes around the Annapurna mountain Range (Annapurna Himal), Dhaulagiri Range and the Kaligandaki River valley. Mt.Annapurna fist (8,091m), Annapurna South (7,219m), Nilgiri (7,061 m), Machhapuchchhre (6,993 m) and Dhaulagiri I (8,167 m) are major scenery. There are also some less crowded Annapurna trek routes in Annapurna region possible to do within 1 – 2 weeks time. Around Annapurna or Annapurna circuit is most crowded trek in Nepal. Mustang is geographically a part of the Annapurna region. But trek to Mustang is subject to special restrictions, describes it in the separate page on restricted area trekking in Nepal section. 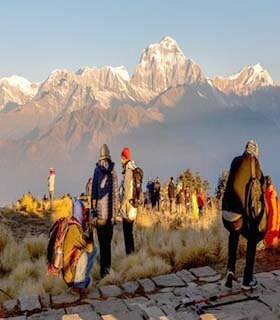 About two-thirds of the trekkers in Nepal visit Annapurna region. 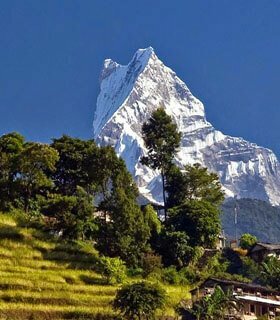 Trek to Annapurna has easy access, hotels in the hills are plentiful, and treks here offer good scenery of both lowland villages and high mountains. Use Gokyo Treks and Expedition to design your eventual experience, and receive hand-made trips built by local trek operator agency. The weather is colder time but generally clear skies. But very a beautiful time to discover annapurna region trekking. 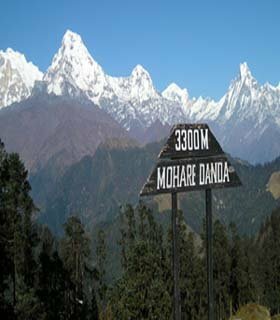 Less trekkers along the trek routes, nice views of Himalaya, winter season, cold at night, fresh and beautiful. Winter storms sometimes in high passes through January and February but changing weather patterns. Weather in spring stays with clear skies and sunny, the temperature is warm to trek in Annapurna. Best time to explore, not very cold high up, not too warm down below. Wonderful weather to trek, blooming colorful Rhododendron (Rhododendrons is the national flower of Nepal) and there are more than 30 species of rhododendron in Nepal) flowers in trek routes, the skies are blue and clear, all views of Himalayan peaks can be seen clearly. Monsoon season in Nepal, so Annapurna trek weather is not very nice. It has a lot of long grassy landscapes in a higher altitude and leeches in the lower elevation. So, it is not a good idea to trek in Moon soon time. Monsoon is over around early of September, but some drops of rains still possible, a lot of new flowers along the trek, beautiful waterfalls and nice landscapes makes your trip wonderful. There are many reasons to choose Annapurna trek but top 5 reasons are given here for your reference. On your journey to discover Annapurna trek route, you can enjoy the top mountain view of Annapurna first (8,091m/26,540 ft), Dhaulagiri (8,167m/26,790 ft), Manaslu (8,156m/26,753 ft), Annapurna south (7,190m/23,585 ft), Annapurna II, III, IV, Fish Tail (6,997m/22,952 ft) etc in a row. Reaching crazy Annapurna means you reach the top one famous trek route in Nepal. 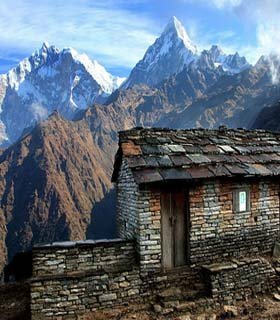 Annapurna trek stays very good lodges. They are clean and modern. Locals rebuilt those guest houses installing modern rooms and toilets with hot-cold showers. Teahouses are comfortable with facilities of twin sharing beds and mobile charging is possible. Hike to crazy Poonhill station is easier rather than climbing Khopra ridges. 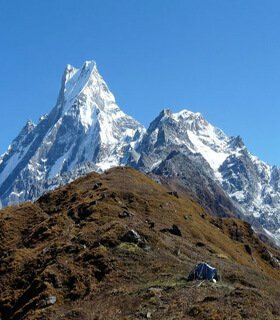 Hike to Poonhill takes minimum 3 days but the hike to Sarangkot is just a day tour. Both of them are the best places for the photography tour. Both of these hill station hiking offers the outstanding view of the Annapurna Mountain range including Annapurna first (8,091m/26,540 ft). Likewise, you can touch the glacier, glacial lakes and beautiful rivers walking in 4 or 5 days trek. Hike to Annapurna route in spring is better than the autumn season. Trek into the spring, Rhododendron forest turns the colorful forest. So, April to late May is the best time to visit. Red rhododendron is the national flower of Nepal. Enjoy the view of red rhododendron in contrast to snow-covered mountains in the background. Enjoy the taste of mouth-watering delicious local food preparing by Gurung community while you receive the warm hospitality at local lodges.